My sweet boy turned 3 and wanted a pirate birthday party. 4 of his closest friends came over for dessert and ice cream, Zane hates cake so I did something creative for that. I'm going to share the different things I made for the party over a few posts so that one post doesn't become too lengthy. My overall goal was to not spend a lot of money, big surprise! But also to keep things simplistic..this is a 3 year old's birthday party after all. Also I didn't want to buy plastic crap to fill a goody bag and junk up someone's toy box. So let's start with the party favor: eye patches! Every pirate needs an eye patch. Also it's a great item to add to any child's dress up box. First, I drew a pattern out and cut 2 patches of black cotton fabric for each patch. I also cut a piece of thick fabric stabilizer to make the eye patch stiff. With right sides facing each other I sewed around the patch leaving the top open. Turn the patch right side out and insert the fabric stabilizer and fold the top inside the patch. Sew around the entire patch again, this closes the opening and attaches the stabilizer so it stays in place. Next cut a 1/4" piece of black elastic to fit a child's head, I cut mine at 17". 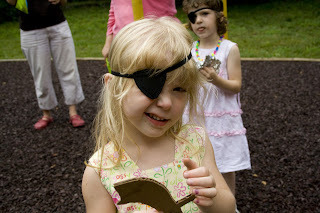 Sew each end of the elastic to the eye patch. And your are finished!